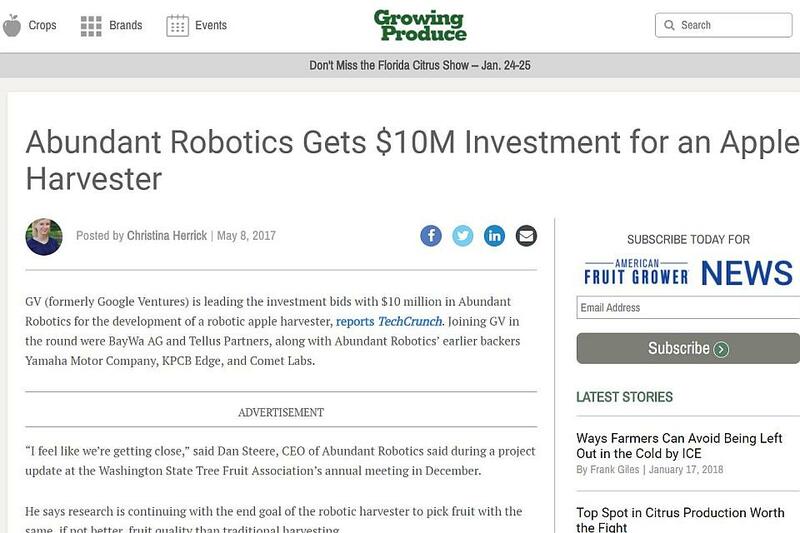 Recent Developments: According to GrowingProduce.com’s Christina Herrick, in February 2017 Abundant Robotics CEO Dan Steere told those in attendance at the International Fruit Tree Association’s annual conference in Wenatchee, WA, that his company is preparing a prototype of its vacuum powered robotic apple picker for commercial sale. He said he expects to have an automated harvester in place for commercial harvests in 2018. My friends, as many of you told me repeatedly throughout the last 12 months, 2017 was an interesting year in Ag Tech. We witnessed needle-moving mergers and acquisitions (Deere-Blue River; AGCO-Precision Planting; FieldReveal, etc. ), intriguing product launches (SmartFirmer, Sentera’s Phoenix Drone, Bayer Digital Farming’s Agritechnica splash, etc. ), and venture capital buy-in like the Ag Tech industry has never seen before (FBN’s whopping $110 million round of Series D Funding). We’re hoping 2018 follows the same pattern. Being in the business of click-generating, a healthy dose of interest in all things Ag Tech tends to help us out as well. With that in mind, we’re going to get the party started on 2018 with a reprisal of one of your favorite features from 2016 (sorry we missed 2017 – got a little busy with that whole launching a new print brand thing – our bad), the Top Companies in Precision Farming to Watch in 2018. Welp, that’s all I’ve got for you as far as an intro. Onto the content. 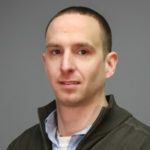 Recent Developments: According to GrowingProduce.com’s Christina Herrick, in February 2017 Abundant Robotics CEO Dan Steere told a trade show audience that his company is preparing a prototype of its vacuum powered robotic apple picker for commercial sale. He said he expects to have an automated harvester in place for commercial harvests in 2018. Recent Developments: Using actual in-field measurements to build on weather models, Arable’s new hyper-local weather forecasting system Point, the first of its kind according to the company, synthesizes ground observations collected from the Mark, publicly available weather forecasts, and artificial intelligence to tailor predictions to an exact pinpoint on a map. Innovation(s): The Arable Mark, an in-field sensor that collects over 40 data points; everything from weather analytics; disease, insect, frost forecasting/alerting; irrigation management; predictive harvesting; new Point weather metrics; Point Forecasts. Innovation(s): See & Spray targeted variable-rate pesticide application technology; Lettuce thinning robot; drone imagery processing analytics; machine learning image collection and recognition system. Recent Developments: Bosch’s innovative Smart Spray technology — think Blue River’s See & Spray but the Bosch version can mix and apply different active ingredients on-demand based on the type of weeds the system is sensing — was announced as a part of the promising xarvio/Bayer Digital Farming platform at Agritechnica 2017. Innovation(s): Smart Spray system at Agritechnica 2017; Intelligent irrigation system in Spanish olive orchards; sensor, IoT, data, etc. Recent Developments: In 2016, the company used its imagery processing technology to reportedly project final U.S. corn yields to within 1% accuracy, topping the accuracy of even USDA’s own estimate. Additionally its been reported that Descartes recently signed a contract with Darpa to monitor crop outputs in the Middle East to warn of food shortages. Innovation(s): A spin off of the renowned Los Alamos National Lab, Descartes reportedly uses proprietary algorithms to analyze photos of the globe and make predictions. Recent Developments: In December announced the largest single round of funding in ag tech industry history, a reported $110 million Series D funding round, led by funds and accounts advised by T. Rowe Price Associates, Inc. and Temasek. Also released results of its Seed Relabeling Transparency report at Farm Progress Show in August and has plans for product expansion within its FBN Direct e-commerce powered crop inputs marketplace. Innovation(s): FBN Direct, Seed Relabeling Transparency Report; aggregated analytics; Crop Marketing platform for growers, etc. Recent Developments: Appearing at our 2017 PrecisionAg® Vision Conference, Microsoft’s Ranveer Chandra detailed progress the company’s smart farming division is making on transmitting and collecting data in rural areas using the old television UHF/VHF “white space” frequencies. Additionally, Microsoft is developing a drone autopilot program that lets a farmer select a field to image, it calculates the most efficient flight plan and autonomously launches – also adjusting in real-time for wind conditions, reportedly reducing the time taken to cover a farm by over 25% and prolonging flight time. Recent Developments: Acquired for an undisclosed sum back in July by machinery giant AGCO; announced the launch of three new products today during its 2018 Winter Conference: 20/20 monitor, SeederForce automated downforce control system, and mSet multi-hybrid seed selector. Innovation(s): Probably too many to list here, so we’ll just go with: A WHOLE LOT. Recent Developments: Semios created a revolutionary, environmentally-friendly method of controlling pest populations in a fraction of the time by using SNAP-based RF modules and Gateways. Recent Developments: The Vikings aren’t the only team that’s on a hot streak up in the Twin Cities. The Minneapolis-based drone startup had a busy 2017, perhaps releasing more new and updated products in the calendar year than any other Ag Tech company. Most notable for ag service providers was probably the release of the Sentera Phoenix Pro drone, which boasts an impressive 59 minute flight time and the ability to cover 750 acres in one flight. Recent Developments: This Purdue University-backed startup signed an agreement in December with TerrAvion to provide imagery and imagery analysis to Spensa customers using TerrAvions image delivery system, OverView. Also have partnership in place with West Coast retailer Simplot. Innovation(s): Smart management of insects, weeds, and disease via proprietary online pest management program, electronic insect trapping devices, and Scouting app OpenScout. Recent Developments: Announced the launch of its driverless tractor automation platform, AutoCart, in January. According to the company, with over two years in development, AutoCart, along with the tractor automation kit, is a plug-and-play system that automates existing grain cart tractors and is compatible with any brand or combination of brands. Smart Ag recently completed a comprehensive beta test of AutoCart on Midwest farms during the corn and soybean harvest. Innovation(s): AutoCart and tractor automation platform. Recent Developments: Announced image delivery partnership with Midwest startup Spensa Technologies; Has collected imagery via network of fixed-wing aircraft and proprietary sensor on nearly 9.5 billion acres of land with delivery of 5 million processed maps. Innovation(s): Core service is called OverView, which delivers subscription imagery, overnight, throughout the growing season. Recent Developments: Presented the xarvio smartphone scouting app at Agritechnica 2017; Plans for North America availability possibly by late-2018. Innovation(s): xarvio smartphone scouting app and Field Manager FMIS program.